1994: A little known-company decides to sell books online at a time when Borders and Barnes & Noble rule. 2018: Amazon is a trillion-dollar company, and Jeff Bezos is the richest man on the planet. Everyone has learned the lessons of Amazon, where cloud services, data analytics, and continuous process optimization transform industries, no matter how challenging they are. And everyone has seen the power of platforms, with the ability to drive profitability, partner, and scale. It’s no wonder that 9 in 10 companies are now going digital-first at top speed. But is that wise? 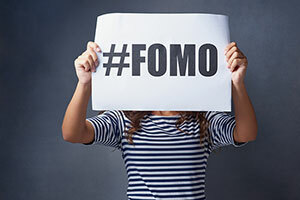 Right now, the market has a major case of FOMO – fear of missing out. That’s causing firms to make rash decisions as they rush to transform. They’re standing up DevOps teams, cloud-enabling legacy apps, and implementing major new customer-facing platforms. All of these are great efforts, but they may not lead to continued success without a transformation-minded, agile organization to back them. Chances are, this is not news to you. You’ve seen the very public challenges of GE, which just took a $23B write-down after spending significantly on the industrial internet. Similarly, major brands like Ford, Lego, Nike, Procter & Gamble have struggled with digital, says Harvard Business Review. As digital pressures increase, firms are staking $100M to $1B or more on bet-the-bank transformation initiatives, and these programs may be at risk. Leaders know it. In a recent survey by Wipro Digital, half of 400 U.S.-based senior leaders said their company isn’t successful executing 50% of their strategies, and 1 in 5 say the company’s digital transformation is a complete waste of time. It doesn’t have to be that way. If your company is struggling with transformation, maybe it’s time to move past FOMO, slow down, and plan for success. Let us help you. At Intellinet, we have worked with many global companies to create the flexible organizational structures needed to achieve transformation goals. In this three-part blog series, we’ll look at old and new thinking about transformation, profile a Top 10 industry leader who created an agile organization to drive success, and share what’s new about the “old” concept of service-oriented organizations. So let’s dig in. Here is our new thinking about transformation and some strategies for success. CIO says that even senior leaders can’t agree on what transformation means. The risk is that companies will commit to disconnected initiatives that look good on paper but add iterative value. You want more. The old thinking was that you could just equip IT and the business to innovate. The new thinking is that you need a clear strategy that you can communicate early and often to everyone – starting with senior leaders and employees, who will deliver the strategy, and including partners, vendors, and investors. The Business and IT Drive Success Together. For more than 20 years, IT has struggled with negative PR both inside and outside of the organization. The message goes something like this: Teams are too insular and solution-focused, and they don’t drive enough value. If IT can’t deliver, the business will go outside for support, and IT will be marginalized into an operations role. That sounds reasonable, until you realize that IT has deep knowledge of customers and processes, and business-led innovation can also create silos. There is simply no need to sideline IT and vendorize everything, and it can lead to a danger disconnect. Both the business and IT need to align around a strategy and work in lock-step together to drive change. Transformation Should Be Customized to Your Business. This truth flies in the face of the “as a Service” revolution where you plug and play your way to success. Yes, cloud services, industry frameworks, and best practices will get you far. However, transformation isn’t out-of-the-box. Your company’s needs and pains, goals, and technology infrastructure are unique to you (while likely sharing commonalities with your peers). So it just makes sense that your transformation program and organizational model will need to be tailored your goals. You Need Your Workforce Like Never Before. Read industry analysts about transformation, and you would think that only the top data scientists and technologists are needed. Yes, IoT, AI, and cloud are changing the world. But everyone is a technologist now: From your front line to your back-end staff, everyone can use curiosity and creativity to find and fix broken processes, adopt new tools to collaborate with each other, and evolve their technology skills. You won’t hire and fire your way into digital transformation. You will build your way there, and a good place to start with is your team. Share your strategy and a future state they can buy into (here’s the money tip, “Change or die” won’t work), and show how they can contribute. Get them to buy into constant learning – and show them how they can contribute. Some organizations will develop in-house training organizations; others will invest in industry-standard training; and still others will espouse a scrappy DIY philosophy and reward those who invest in themselves. In a transformation culture, change is constant. So let’s get started.